Travel Reports | His Kids Too! The winter of 2006, a most brutal one, brought much, snow, sleet, hail, and Floridian Rich Fillmon to Ukraine. The journey began Jan. 18, arriving in Ukraine to blizzard conditions I traveled with His Kids, Too! board members, Lynn and Ray. After 2 days of travel, I arrived in Dzerzhinsk. The roads were so bad that the driver could not take us down the street to the house, and we were forced to walk 300 yards. through 3 ft. of snow. The purpose of this trip was to work with the church in Dzerzhinsk, distribute thousands of pounds of aid to orphans, and finalize the plans for the spring workshop. We encourage you to review the photos in the Photo Gallery. There are not a lot, due to the freezing temps, the camera froze several times, but I was able to ‘capture’ the essence of his trip. First stop was the Dzerzhinsk Internot where the director warmly welcomed us. The children were thrilled to see us, as this is where the annual Bible camp is held, and the kids all love to see us. Sound Bible teaching, and genuine love for the children is evident in their response to this visitor. They had a small group for church, as most of the children were in homes, trying to stay warm, as the pipes froze at the school/orphanage. Returning the next day, we took several boxes of clothing, and purchased fruit for the Go Bananas for Orphans program. These children receive weekly fruit, because of the efforts of Kristy C. in Valdosta, GA and the great students at Lowndes Co. High School. We gave the kids a ‘belated’ Christmas celebration 4 kilos oranges, 4 kilos bananas (fruit was difficult to find at the market), cookies, candy, homemade lemonade (which was a big hit with the kids), composition books, and boxes of pencils (thanks to Hania Little), and little toy gifts for each child. We are so happy to report that this internot facility made it to the city playoffs in basketball! A huge accomplishment for an orphanage facility, and we are very proud of the boys. The coach had requested one thing, a leather basketball. While we were in Donetsk we made this purchase. After returning to Dzerzhinsk, we were able to present the gift to the coach, who was speechless! He stated that the regular school receives all the really great equipment, and the Internot’s get the leftovers. His Kids, Too! is going to work on changing that. We hope that you will help! Additionally, several VHS tapes (in Russian) were left for the kids. The next stop was the ‘New York’ Internot, where the pipes had also frozen and blizzard conditions, so there were only 40 kids there. They received bananas, oranges, tangerines, cookies, candy and lemonade, all was a big hit! The kids also received 4 large boxes containing an assortment of clothing, shoes, (thank you Buckner International) and toiletries. This facility will be home to His Kids, Too! first Bible Camp, and they are waiting with great expectation for the summer to arrive. To round out the aid to the village of Dzerzhinsk, we made a visit to the Artum Orphan Hospital. They were delighted to see us, and happy with the boxes of baby clothes (thank you Neve and Friends), toys, and asked for a couple of needed items (scales and potties). We were able to fill that request, and later returned with those items. Getting to Donetsk was the next challenge due to the weather. We had at a minimum 700+ lbs. of humanitarian aid to get there, but road conditions were impassable. We waited a day and sorted more aid, and prepared for the trip. It was important to be organized on the delivery stops on the way to Donetsk, while we had a driver and a big enough vehicle to take boxes. Due to the weather, many drivers just refused to work, in addition to the high fuel costs. One had to ‘book’ a driver days in advance. As we left for Donetsk, we made several stops along the way to drop off aid to different places and families that His Kids, Too! serves. Arriving in Donetsk, the first stop was Our Children. The director, a very pleasant person, was happy to see us, and 3 huge boxes of aid were left at this facility. Additionally, Lynn and Ray, the board members who live in Ukraine, met us. We were allowed to interact with several of the children, and dressed them in new clothes, and presented many new toys to them. The next stop was the Teremok Orthopedic Hospital. The director, a totally delightful woman, was happy to see us, though surprised, since it is usually Teresa that travels. They currently have 57 children, but that number fluctuates. Vitamins were requested and purchased for the facility, along with requested fever reducer (which we had already). Discussion on the plight of CP children and adults ensued, as the director has full knowledge of this topic. She was able to shed some light on this, which gave us a greater understanding of the urgency of making some decisions concerning our future role with this population. Two large boxes of winter clothing, along with one box of toys were left with this facility. After some rest, the next stop was the local Homeless Shelter/Transition Home for ex-convicts, and adults living on the street. Greeted by the director, he gave a full tour of the facility to us. The director was very open about the facility, their mission to the community, and was clear to state that their facility was the only one of it’s kind in the region. They were able to feed and sleep 30 persons, but with some renovations (His Kids, Too! was able to help with mattresses and bed linens), they now can help 50 persons. He was very gracious and happy to receive 3 large boxes of adult men’s winter clothing. Moving on, the next stop was the Homeless Children’s Shelter. This facility usually home to 75 children, but due to the harsh winter 150 children were seeking refuge at the facility. They were packed, and happy to receive the 4 large boxes of winter clothing. We thank Glendale Rd. Church of Christ for the great winter coats. The final stop for this day was the Aids Hospital, where His Kids, Too! is well known. The Director and head Dr. were happy to see the group, and graciously toured the facility with them, allowing for lots of photos. The hospital was almost at max. capacity of 85, 14 of the children have confirmed Aids, the rest are in the testing process to determine a diagnosis. Obvious signs of aid left by His Kids, Too! on previous visits were evident, crib mobiles, blankets, clothing, toys, the children were happy and are well cared for. Diapers were requested, and immediately purchased and sent to the facility. Returning to Dzerzhinsk, the trip was coming to an end, but the snow was still coming down! Each facility received another visit, delivering requested items that were purchased in Donetsk. Each time, we were warmly greeted, and encouraged by the enthusiasm of the children. On each visit more fruit, cookies, and juice were distributed to the children. The winter was very harsh, and many children are sick with colds, fever, respiratory infections, etc. This trip also was the beginning of a pilot program for orphans. We are excited about this program, and will provide more details as the program develops. The main goal is an effort to keep children out of the Specialized Children’s home, and the Invalid Homes. The city of Dzerzhinsk is embracing this program, and we are happy to provide the service to the community and children. Plans were finalized for the Spring workshop and plans for the Summer Camp were formulated. Wehn Teresa comes in Spring, all this will be completed. Thank you again for your prayers, concerns, and commitment to the orphans in Ukraine, without your help we could not do this vital work of reaching the lost for Christ. We are all called to ‘go’ (Matthew 28:18) some go to the store and purchase items to be sent to Ukraine, some are called to organize collection of clothing, some write a check to help someone else ‘go’, or to help with the work there, some pray for those who do ‘go’, some pray for the orphans, and some travel thousands of miles and ‘go’ to Ukraine. All equally important, and we all play a role in the great commission. Thank you! Director of Communications/His Kids, Too! October is a great time to travel to Ukraine. The weather is fairly nice, and the trees are beautiful. His Kids, Too! Director, Teresa Fillmon, advisory board member Walter Steely and volunteer Kevin Mack had 2 busy weeks in the Donetsk region of Ukraine. Our time was well spent, moving throughout the region, visiting 18 facilities housing over 4300 children and adults, and leaving a trail of aid on our path. Because of your generous giving, thousands of children and adults received clothing, medicine, food supplements, shoes, bedding, toiletries, and much more. It was a great time of fellowship for the saints at the Kirovo Church in Dzerzhinsk, and each worship time brought visitors. The church helped with a great service project of putting together the personal care bags for the orphans. We met an American woman adopting 2 of our wonderful students from our summer Bible camp. Her mother was accompanying her, and it was such a joy to get to know them, and have their assistance with clothing distribution at the local Internot. We hope that we can continue our contact with the kids and their family, after they return. Additionally, another set of siblings are being adopted by a Canadian couple. It was really exciting to know that 4 children are moving into great homes, but we should continue to pray for that transition. Overall, adoption in Ukraine is in need of prayer. Hundreds of couples wait for the government to reopen for new dossiers, while they try to serve those who have already been waiting for over 1 year. It is vital that each of you know that you are important to His Kids,Too! You play an important role in the life of a child. Every donation is appreciated, every toothbrush, every bar of soap, every pair of shoes, every heavy coat, etc. Without you, there is no way we could serve the thousands of unserved orphans and needy in Ukraine. You are making a difference! 3 boxes of clothing –Rachel E., Raa Middle school, Stuart W.
Bananas* Cookies clothing – shoes Hats – Hania L.
Kremenchuk Boys Prison 8 large boxes of jeans – Margaret S. and Glendale Rd. CoC. We are excited about what God is doing in the hearts of so many people in Ukraine and are thankful for the continued opportunity to serve them. Volunteer Updates: We are thankful that Kevin Mack was able to join us in Ukraine, and his medical knowledge was helpful. We hope that he and others will join us for a future trip. Special thanks to Margaret S. and her colleagues and friends Five HUGE boxes of clothing arrived. See Photo Gallery for photos. Additionally, because of a generous sponsor, the Artum Orphan Hospital has a rehabilitation room. We are pleased to report we are bringing another child to the states for medical care, and we are thankful to Fresh Start for their support in this effort. We are thankful to each of you for your continued support. His Kids, Too! has well over 500 volunteers in over 17 states. God is good! PRESENT NEEDS: Please note our needs area below each facility listed above, as needs are ever present and many times facility specific. – Christian Children’s Home – we are happy to report that progress is being made, and since we are registered FUND in Ukraine; this will greatly benefit the status of this project. Funds are still needed to complete the project, please earmark your donations: ‘Christian Home’. We thank you again for your love, support, prayers and encouragement, and we look forward to hearing from you. It was an exciting summer in Ukraine as 6 His Kids, Too! volunteers arrived June 23. This trip was in conjunction with Dr. Bill Wharton’s summer Bible camp group, going to provide a Bible camp to orphans and school children. After the week long camp, His Kids, Too! volunteers continued to provide evening Bible classes while during the day working to distribute aid to thousands of orphans throughout the region, in addition to reaching out to the local community’s' elderly, disabled, mentally ill and poor. This was the 5th year for our annual Bible camp. Daily, we (and 14 others from the U.S.) presented stories from the Bible to over 200 children. We eagerly anticipate next year and invite you to join the team. Seeing the fruits of the labor usually takes lots of time, and this year was no different. We are seed planting and watering seeds planted in the past. One exciting event occurred when the Internot children asked to come to the evening Bible services, which were quite a distance away. Each afternoon, I would hire a minivan to go transport them. We were blessed in many ways, and it was exciting to see one of our translators make a decision for Christ. Nikka, 22 yrs. old, took a cold plunge at the sauna (the only place we could find enough water to baptize her), and was baptized into Christ on July 8! The following week two more team members arrived, Dallas and Ashley. We were scheduled to have our Bible camp, but a most unfortunate thing happened. The local miners group decided to send all the children to summer camp for 6 weeks. Though we were disappointed that we could not share the gospel with the children, we were very happy for the opportunity for these developmentally delayed children. We made the best of the situation, and this extra time allowed us the opportunity to visit 2 additional orphan hospital facilities. Affording us time to purchase cribs, mattresses, clothing, diapers and more, in addition to serving the local community (see the photo gallery for photos). The extra time allowed us the chance to provide nightly Bible studies to the community. Each night people gathered for Bible study at our home. Numbers ranged from 15 to 29. One of the most exciting things was that three of our students from the Internot that we had taught during the Bible camp attended the studies. It was a miracle to see the hand of God work in these three teenage boys’ lives. By the second week, they were asking questions and seeking guidance. We have known these boys for years because they have been a part of the annual Bible camps. “Seeds were planted and watered,” and the Spirit of God has begun to take root. We are very excited that these young men are seeking God, and we ask for your prayers concerning them. We frequently see groups come in, convert people, and then never return to help them mature in Christ. About 99% of those converted in this way “fall away” because they were not taught or matured. Many see it as a way to “rich Americans'” hearts, and just “do” what they think we expect and want them to do. What we have seen in the years that we have worked in Ukraine, is that deep spiritual commitment takes time. Just like Jesus taught his disciples, we slowly and accurately teach people how to live a Christian life. Since Christianity is so new to Ukraine, many of the foundational principles of Christianity must be taught before they can have an understanding of what a Christian is, and how Christ calls us to obedience in all areas of our lives. We have been blessed to be able to return, time and time again, to nurture and try to exemplify Christ to the lost of Ukraine. We ask for your prayers and support. We encourage you to join us when your schedule permits. Adoption (www.cornerstoneadoption.com) is a part of His Kids, Too! We are helping families with the process from start to finish. We were happy that we were able to get accurate figures on orphans. Presently, there are lots of questions concerning adoptions. Ukraine, a country of over 47 million, is host to 13,188 registered orphans (confirmed June 2006, adoption seminar, Kyiv Ukraine), with 3228 in the age bracket of 0-3. Granted, there are many more children in orphanages and Internots, but these are figures on registered (available) orphans for adoption. Presently, Ukraine is moving in the direction of foster care for all orphaned/abandoned children. 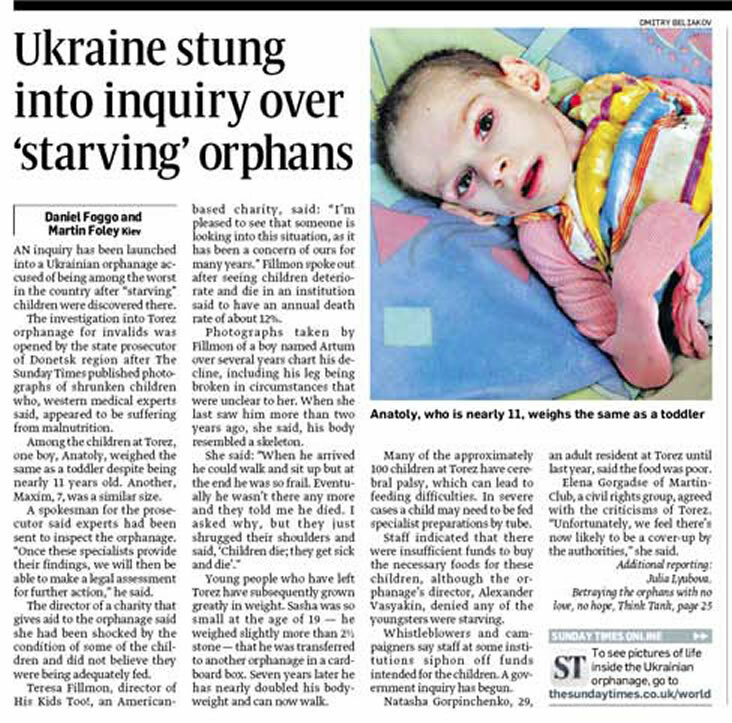 Ukraine is going to take care of their “own.” Adoption will still be possible, but the only children that will be in the orphanage facilities are disabled children that are waiting to be placed in foster care homes. Foster Care homes will be government subsidized, and people will be given a monetary subsidy along with, medical care stipend, a car/van, and funds to build or buy a larger home. These incentives, along with the desire to help orphans, are proving effective, as we personally know of 3 Ukrainian families that are providing foster care to orphans. His Kids, Too! presently supports one family with 6 (and adding more) foster care children. His Kids, Too! 's main focus is providing life sustaining humanitarian aid to orphans. This trip was no different then any other. We especially want to thank the over 200 volunteers who sent humanitarian aid to Ukraine for distribution. This aid of clothing, shoes, toys, sports equipment, medical supplies and more, was sorted and distributed to over 3,700 children, teens, adults and the elderly. We welcome you to review our photos in the Photo Gallery. Below is a detailed list of the facility, aid given, and present needs. You may notice that we added three more groups, one orphan hospital, and two Ukrainian charities working with the disabled (with intact families). We stress that accountability is provided to our donors. Please review and forward any questions to us. Mattresses liners – Frieda H.
Personal care bags – Central CoC, Sandy J.
Canvas bags for camp – Peggy N.
New shoes – IPC and Buckner, and Anne H.
3 boxes of clothing – Neve and Friends, Rachel E., Raa Middle school, Stuart W.
Clothing – Raa Middle, Andrea R. and friends, Stuart W., Rachel E.
Canvas bags – Peggy N.
2 boxes of clothing – Rachel E, Andrea Robinson and friends, Anita B. Toys – Jody G., Rick S.
Large bag of clothing – MWCOC, Kathy G., Betty R., Jane W.
One very large box of mixed adult and children clothing – Andrea R., Jane W., Kathy L.
2 bags of shoes – Kathy G., Kathy L.
Without the help of so many people, we could never serve all these deserving children and adults. We try to direct people towards self-sufficiency, but that doesn’t always work, especially for young orphans. We steer all Internot children to make wise Godly decisions, by talking, teaching and praying with them. We are excited about what God is doing in the hearts of so many people in Ukraine and are thankful for the continued opportunity to serve them. Volunteer Updates: Please note our needs area below each facility, as needs are ever present and many times facility specific. We are thankful to the many individuals that have picked up the volunteer ball and have taken specific causes on and have successfully provided aid to hundreds. Special thanks to Margaret S. and her colleagues and friends for their special interest in the Kremenchuk Boys Prison. These boys are the forgotten orphans, due to their criminal activity. Many of which were only trying to survive: the orphans are at the bottom of the help chain (along with the invalids). Five HUGE boxes of clothing are on their way, and funds to assist with food, medicine and other ministry needs. Additionally, because of a generous sponsor, the Artum Orphan Hospital will have a rehabilitation room in the Fall. The room is presently being prepared and equipment is being ordered. The IPC Foundation has been wonderfully generous, and you will notice the number of items in the summer distribution that can be attributed to their support. We are now in the process of bringing another child to the states for medical care, and we are thankful to Fresh Start for their support in this effort. Large clothing donors, Frieda H. and friends., Anne H., Andrea R. and friends, Rachel E., Anita B., Raa Middle School, Rick S. and friends, Kathy G., Kristy C.. Our Blanket Group: Mary D. and friends, have made over 500 blankets! God is good! – Christian Children’s Home – we are happy to report that progress is being made, and since we are registered FUND in Ukraine, this will greatly benefit the status of this project. His Kids, Too! has always been a charity focused on doing the will of the Father and furthering the Kingdom of God, and we remain open to the leading of the Spirit for new ministry opportunities in Ukraine. In response to that leading, in 2006 His Kids, Too! has already embarked on several new ventures, and we are implementing the necessary steps to bring these new ministries to fruition. We encourage you to view our Spring 2006 trip photos in our photo gallery. In addition, the Gift Shop contains new items and all proceeds benefit orphans. The Spring 2006 trip provided a new opportunity for ministry when His Kids, Too! Director Teresa Fillmon traveled with U.S. educators to Ukraine for several presentations to orphans and school children on the importance of abstinence, the pitfalls of abortion (reminding them it is not a form of contraception), and protection from AIDS (Ukraine is presently the fastest growing country per capita for AIDS), risks of STDs, prenatal care and substance abuse. The theme of the presentations was the fact that they are precious children of God and making wise choices is vital to a healthy, long life. We were embraced by city officials, school officials, parents and children, eager to hear and see the information. We were very blessed to have Amy B. from Huntsville, Alabama as our technology guru; George S. from Fresno, CA who taught the boys on the above topics; Peggy N. from Fresno, CA, worked with the girls on the risks of substance abuse during pregnancy; and Erin F. from Fresno, CA, who provided information on AIDS, abortion, STDs, and fetal development. All presenters encouraged abstinence before marriage. Presentations were well received, and an invitation was received for ‘more of the same’ in the future. In addition, the educators worked with local teachers to help trouble shoot some areas of conveying this material to the students in the future. Artum Baby Hospital: Thanks to Dana and Mark E., this facility now has 5 new cribs with mattresses and 3 new high chairs/tables. In addition, they were given blankets, baby clothes (thank you Neve and friends, and Michelle Smith), busy boxes for the new cribs, new sheets and mattresses pads, cloth diapers, and baby toys. Needs: a ‘ball pit’, physical therapy table, and other equipment, white nurse uniforms or scrubs. Dzerzhinsk Internat: Special thanks to Buckner Shoes and Jeremiah’s Hope for newshoes! This facility also received clothing (thank you Andrea Robinson and friends), personal care bags, socks, sports equipment, blankets (thank you South Trail CoC), shampoo, and bananas (this facility is part of the ‘Go bananas for Orphans’ program). Needs: more shoes, sporting equipment, would like $200.00 to purchase basketball uniforms for 15 boys. Dzerzhinsk Shelter: (This facility is temporary home to former street children. Many, many children come through their doors.) We provided clothing, shoes, personal care bags, sport balls, puzzles, and toothpaste. Needs: Clothing, personal care bags, more sport equipment, funds to complete renovations of the facility. Novgorodsk Internat: (This facility is doing well, considering the conditions. The staff are wonderful and waiting for each of our visits. We are pleased to say that they will participate in the firstHis Kids, Too! summer Bible camp, and they are thrilled.) This facility received clothing (thank you Andrea R. and friends, and Darlene S.), blankets (thank you Frieda H.), shoes, crayons, color pencils, hats, and scarves (thank you Hania Little). Needs: Sports equipment, personal care bags, shoes. Donetsk Shelter: Special thanks to Buckner Shoes and Jeremiah’s Hope for new shoes! This shelter also received clothing (thank you Stuart W. and friends, and Raa Middle School in Tallahassee, FL), and blankets (thank you South Trail Church of Christ). Donetsk Adult Shelter: Clothing (thanks to Guy Moore of Garnet and Gold of Tallahassee). Needs: Small men’s and small ladies’ clothing. Teremok Orphan Hospital: Clothing and toys (thank you Darlene S.. Neve and friends, Raa Middle School), shoes. This facility receives juice and diapers in an on going program. Our Children: (This facility was under measles quarantine during our visit, so we were only able to see 2 rooms of children. The director and staff were warm and friendly. It was great to see the child with severe burns with his ‘soon to be’ parents.) We left one huge box of new clothing (thank you Anne Huell). They receive juice and diapers monthly, in addition to special medicine and other medical needs. AIDS Hospital: (This facility was under entire measles quarantine.) We delivered 2 big boxes of clothing, shoes, blankets, some medical supplies, toys (thank you Neve and friends), and knitted hats (thank you Hania L.). Home of the Forgotten: (We were very warmly greeted. The Director was pleasant and affirmed that he graciously accepts our donations and is pleased with our work. This facility, home to 330 children and adult ladies, is truly a sad place.) We delivered 4 boxes of clothing (thank you Guy M. – all clothing was new with tags), and 40 kilos of bananas (Go Bananas for Orphans). We passed out 10 kilos of cookies, some shoes, and over 40 blankets. We also gave them 200 cloth diapers (Thank you Glewview Road CoC). Needs: This facility provides a needs list, in which we are able to purchase items in Ukraine. Several projects are being reviewed for implementation at this facility. Funds are welcome. Donetsk Adult Homeless Shelter: Adult clothing (thanks to Frieda H., Elizabeth Morgan, Andrea R. and friends, Pam and George A., Kathy Gunter). Orphan Boys Prison: (NEW FACILITY – home to over 100 mostly orphan boys. All are very thin.) This need was presented to us, we did not visit this facility. Needs: Boys clothing 12 – 28 waist slim, small and medium shirts, shoes up to size 10 men’s. Drop us a note for the shipping address. Each Sunday we spent time at the local Internat worshiping with orphans. Team members presented the Easter story to the kids, along with a great craft, and the kids thoroughly enjoyed it. On one Saturday we offered a workshop/fun day for the disabled community of Dzerzhinsk, with games, crafts, and refreshments for all who came, and professional assistance for parents with questions and concerns for their children. Our time in Ukraine was well spent, and thousands of children were helped. In addition, hundreds of young people were given the tools and information to help them make wise decision concerning their behavior. We look forward to summer and the ministry opportunities that lay before us. If you or someone you know is interested in joining us on a trip, please contact us. His Kids, Too! is excited about the opportunities in Ukraine. God continues to open doors and provide volunteers and funding to the many programs to help orphans. We covet your prayers; we appreciate each of you as a valued participant in the work in Ukraine. We can’t do this alone. Thank you again. Please do not hesitate to contact us for more information. Our fall visit to Ukraine was exciting and very busy. We were pleased to have 3 additional sets of hands with us, as accompanying me were Peggy N. and Erin F. from CA, and Walter Lee S. from Murray KY. Time was short and work was aplenty, to God be all the glory. Our mission was 2 fold on this trip. First, Peggy and Erin were invited to give several presentations to the ‘young ladies’ of internots (boarding schools), shelters, and to local hospitals concerning women health care issues, and the dangers of drinking while pregnant. Of course, one main focus was abstinence, but the reality is some do not, thus issues like abortion, STD’s, alcohol, smoking, drugs, were reviewed, using a Godly perspective to teach the young ladies that these behaviors are not in God’s plan. Additionally, a workshop was presented to a local group of children with disabilities, their parents, and some local educators, showing them that these wonderful children can be integrated into the community with other children. Peggy, a physical therapist, demonstrated different techniques to enhance muscle tone, and encourage parental interaction with their children. Special thanks to Walter for ‘lugging’ his heavy laptop 7000 miles, as the DVD’s were a real ‘hit’ for the different groups. We had several local officials present at one presentation, and we are happy to report that this type of teaching is welcome. We have been invited to present a citywide workshop to all the public school administrators, teens, 2 groups working with the disabled, and to interested parents. Plans are in the works. If you are interested in the Spring ministry opportunity, contact us directly. Second, our trip would consist of visiting the facilities that His Kids, Too! already is servicing, assessing new needs, visiting new facilities that have requested assistance, working on the details of our Christian Home, visiting with church members, and teaching ladies Bible class when possible. With the help of the Lord and our wonderful interpreter, Vanya, all these goals were met. We encourage you to view photos from the trip on our website: www.hiskidstoo.org, under the Photo Gallery, Fall 2005. Below is a more comprehensive description of how you impacted the lives of children across the ocean, and what the needs are for spring 2006! Dzerzhinsk Internat (61 orphans, 435 children) facility where ladies conduct Sunday A.M. Bible study: hats (thanks Honey L.), gloves, scarves (thank you Frieda H.), clothing (Raa Middle School); shampoo, toothpaste, markers (Peggy and Erin and friends), and crayons, sporting equipment, cookies and bananas. Erin and Peggy gave presentation to teen girls. Dzerzhinsk Orphanage (39 kids) and home to one of the 2 Sunday Bible studies: clothing (Raa Middle School), shampoo, toothpaste, markers (Peggy, Erin and friends), crayon books, sport equipment, cookies and bananas. The Norvgorosk Internat is home to 50 orphans: Personal care bags for all children, clothing, sports equipment, markers, books, shampoo, and toothpaste. Erin and Peggy gave presentation to teen girls. Donetsk Internat: Funds for personal hygiene products for girls – $80.00 monthly for 100 girls. Erin and Peggy gave presentation to teen girls. Donetsk Feeding Program: This program started with 50 people, 3 have died (from age), and 3 are involved with one on one Bible studies. We have had one baptism so far, and one attends the Ukrainian Bible Institute. The program has been expanded to 70. In addition to food, clothing is provided when necessary. Dzerzhinsk Feeding Program: This program has been disbanded to allow the local church to pick up this effort to assist their members. In general, any program should be a segway to teach, not enable, thus the saying, ‘you can feed a man a fish, or teach him to fish.’ We will revisit this program in the spring. Donetsk Home for former convicts/homeless people (30 beds). This facility, run by the government came to our attention by Ray G. a His Kids, Too! board member. After a visit to the facility, it was determined that indeed we could assist these folks with mattresses, sheets, towels, and much needed clothing. This small assistance will help them get re-established in the community as productive citizens. Donetsk Home for Mentally and Physically disabled men ages 18 and up: After visiting the ‘Home of the Forgotten’, we noticed that some of the older teens were missing. Upon questioning, we were directed to this facility. We came completely unannounced, and what we found was exceptional! A total surprise, and actually we encourage you to view the photos, as words can’t describe it. KUDOS to this director for his wonderful stewardship of the funds he has been given!!! Aids facility: the needs of this facility are being fulfilled, thank you Amy B.
Donetsk Internat: Funds for personal hygiene products for girls – $80.00 monthly for 100 girls. “The Forgotten” – This facility provided a needs list, and several U.S. churches are working together on this list. Specifically, personal hygiene products have been requested. Funds are needed for this desperately needy facility. Up coming events for His Kids, Too! : – Continue to ship aide to Ukraine for distribution – His Kids, Too! Director will be speaking in Valdosta GA, and Fresno CA. bringing awareness to the plight of orphans – Spring workshop in Ukraine, if you are interested, drop us a note – Continue to assist Christian families with adoption services in Ukraine – Continue to provide adoption grants to adopting families, when funds are available – Continue to take the gospel of Christ to the lost souls of Ukraine, and encourage those in the brotherhood to persevere in the faith – Christmas bags for orphans – we have a group working on this, please drop a note if you are interested in taking part. I would like to personally thank Peggy N., Erin F. and Walter Lee S. for their sacrificial giving on this trip. Their time, energy, prayers, and funds were awesome. We serve an amazing God, and He provides our every need. He continually opens doors to opportunities of service, and you continue to provide the financial support for these programs. Some situations are more desperate than others, and we pray for discernment. We covet your prayers and appreciate your encouragement, and continued support. It was a joy to visit with friends, church members, orphans, directors, and many others, when the entire Fillmon family traveled to Ukraine for 4 weeks. We arrived safely, and were off by train to Dzerzhinsk. This trip was a combination humanitarian aid work, and conducting Bible camps. Over twenty two Americans descended on Dzerzhinsk in order to provide the love of Christ, and much needed aid. The children eagerly awaited our arrival, and we came with joyful expectations ready to sow the seeds of Jesus. There is a detailed list of distribution at the end of this report. We encourage you to review our website, www.hiskidstoo.org to review the Summer 2005 Photo Gallery. The first 10 days of our trip we visited facilities and then we had the camp. Each day leading up to the camp was filled with the work of the Lord, visiting facilities, clothing children, ministering to presented needs, and teaching and encouraging the saints. We arrived in Dzershinsk greeted by thousands of pounds of aide for the 14 facilities that we are assisting. In just 4 days we distributed over 1000 lbs. of aide to hundreds of children. The Bible Camp consisted of 2 camps, 1 at a local school, the other at the local Internat (Boarding School) for orphans. Eighty children were at each camp. Every child received a Russian Bible, and many gifts, and each day was filled with learning, singing, playing, and praying. We would like to extend special thanks to the Levy Church of Christ, of Little Rock, AR, for paying for all the meals at the Boarding School for the week of camp. The children were fed a morning snack, and a nice lunch (see the photo gallery). In Dzerzhinsk, His Kids, Too! serves a local orphanage (50 +/- children), Artum Orphan Hospital (25+/- children), the local mental hospital (40 patients), the local Boarding School (school for 450 children, and home to 60+ orphans), a local group of disabled children (35), the Dzerzhinsk Church of Christ (40), and a Christian Church (140). We visited each facility, (many more than once) and aide was given. We are also serving 11 widows with monthly food bags, in addition to helping with the Donetsk feeding program (60 persons). The Norvgorosk Internat is home to 55 orphans. This is a very poor facility and we have built a good relationship with the director and staff. She welcomed us warmly, and appreciated the orphanage assistance. The children were still wearing clothing from our last visit, and we could see other items we had previously donated. Stewardship is very important, but also, remembering that kids are very hard on toys, shoes, clothing, etc. We understand that most things will need replacing frequently. In Donetsk, we visited Teremok Orthopedic Hospital (60 +/-), the Aids facility (130 children), Our Children Orphanage (150 +/-) and Internot #1. At each facility we were greeted warmly, and everyone was pleased with their gifts. We have some specific needs for these facilities, which will be listed below. During the Bible camp, children were taught about, respect, honesty, prayer life, and life of Jesus. Evening classes were offered for all, and for the week after adult Bible classes were held. Several ladies classes were offered, studying practical Christian living, Ruth, resolving conflict with others, prayer, being ‘fruitful’ and much more. Attendance was good for these spiritual gatherings. Donations and Needs: Below is listed the aide that was left at each facility, and their present needs. Dzerzhinsk Boarding School: 3 sets of clothing per child, shoes, socks, personal care bags (soap, shampoo, conditioner, toothbrush and paste, combs, hair clips for the girls, nail files, pencils, pens, stickers, chap stick), sheets, towels, toys/games, sport equipment, medicine, bananas and cookies. This facility hosted the Bible Camp and children were treated to prizes and gifts every day, and each received a Bible. Needs: personal care bags (a constant need), shoes, 3x ointment, Band-Aids. Dzerzhinsk Orphanage: 3+ sets of clothing per child, shoes, socks, toothbrushes and paste, large bottles of shampoo, soap, sheets, towels, toys/games, sport equipment, medicine, bananas and cookies. This facility had “Christmas in July” thanks to the students of Raa Middle School, see the Photo Gallery for photos). This facility is where the orphan church meet. Artum Baby Hospital: Blankets (thank you South Trail CoC), clothing, toys, busy boxes for cribs, medicine, bananas, cookies, and a special request: electronic blood pressure machine for children and the accompanying stethoscope. Special thanks to Neve and friends for the GREAT TOYS and clothing! Needs: rubber pants for clothe diapers, diaper ointment. Internot – Donetsk: 200 bottles of decongestant, and continue to supply feminine hygiene products for the girls. Needs: Funds for feminine hygiene products for 75 girls. Cost $80.00 per month. Norvgorosk Internat: 3 sets of clothing per child, socks, personal care bags, toys/games, sport equipment, medicine. Needs: personal care bags, shoes, clothing, new mattresses ($500.00); computer to process paperwork ($500). Widows:11 local widows received their monthly food bags. Bags contain: sugar, rice, macaroni, flour, kasha, canned meat, tea, soap, toothbrush/paste and floss, pain reliever tablets, other personal items. Items do vary according to prices. His Kids, Too! has joined in the assistance of feeding 60 poor families in Donetsk. These combined efforts will cost $450.00 monthly to feed 71 people. Needs: Funds for the feeding program. Home of the Forgotten Children: 350+ children/adults: 4-33 yrs. of age. Over 1000 lb. of new and gently used clothing was distributed. Special thanks to Guy Moore of Garnet and Gold for all the new clothing; personal care products (special thanks to students of Raa Middle School, Maranatha Christian School, Tallahassee Home Schoolers, Central Church of Christ Children's Bible classes and more. Toys for children. (Raa Middle School. Special thanks to Kids Expo, over 500 bottles of decongestant was distributed. Bananas and cookies to all the children and adults. Needs for 300 + people/children: Funds to purchase mass medicines and syringes ($40.00 per box of 1000), plastic pants and pins as “children lie in their waste”, and Depends, plastic sheeting ($100.00), much needed PRAYER for the director and those in charge of this facility. Dzerzhinsk Church of Christ (40) and a local Christian Church (140): Both of these wonderful churches were left boxes of new and gently used clothing, and over 100 bottles of decongestant. Needs: at this time, we can fulfill the needs of these 2 churches. You may have noticed the number of times we took bananas and cookies to children. With an idea from volunteer Kristy Cates, His Kids, Too! has branched out with a new program to supply children with bananas (or seasonal fruit) to the children. Please click on the banana on the homepage to get more information on how we are “Go Bananas for Orphans! ” and how you can help provide fruit for orphans! This trip also afforded the opportunity to visit the Christian Home we are trying to purchase. The big ‘plus’ at this point, is that the government officials have agreed to GIVE the building to us. The former kindergarten is in need of repairs, but is in a good country location, on the bus and electric train route. We covet your prayers for this transaction to occur soon. The established cottage industry with many of the ladies in the church is going quite well. The children Ukrainian costumes, some with matching doll outfits available in the His Kids, Too! Gift Shop are selling well. All proceeds will go to these ladies which will give them an income. In addition, more items have been added to the Gift Shop! This trip was a good one, but a difficult one. Our visit at the home of the Forgotten Children was very difficult, as our little girl Kristina had passed away. The staff at this facility are tender hearted, though the management is difficult, at best. We covet your prayers for a heart of mercy to these children and adults. We also had the opportunity to pay our respects to our dear friend, translator, sister in Christ, Christina who passed away, at 19, on April 2. In Ukraine, each cemetery plot is surrounded by an iron fence, and it brought a smile to our faces to see hers painted appropriately in pink. Our only comfort is that she is resting in the Savior's arms. One highlight of the trip was the weekly church services with orphans. Established by Yuri Yenataski in the spring of 2005, members of the local Church of Christ go each Sunday morning and meet with orphans (ages 3-18) and workers at a local orphanage. It was exciting to see the children reading their Bibles and joyfully singing beautiful songs to our Lord and Savior. Each time we saw the children, they would ask, “are you coming Sunday?” The workers too, were happy that we were coming, and eagerly welcomed us. We look forward with eager anticipation as this program grows. If you are interested in helping this program, the cost to provide weekly snacks, and transportation for the church members is $30 monthly. Upcoming trips: Teresa will return to Ukraine in October, and will visit each of these facilities again; over 1000 lb. of winter aide await distribution in Ukraine. More is on the way. We thank each of you who support this work through your prayers, encouragement, and financial giving. Every dollar can make a difference. Lives are changing. To God be all the glory! Our spring visit to Ukraine was different from any other visit and very busy. His Kids, Too! director, Teresa and her son, Dallas, accompanied her on the trip. Dallas has been serving orphans since 1999, and this was his 8th trip to Ukraine. Our trip would consist of visiting the facilities that His Kids, Too! already is servicing, accessing new needs, visiting new facilities that have requested assistance, visiting with church members, and ministering to Christina, our translator, friend, and sister in Christ. After arriving, and visiting with Christina, our schedule changed, as our priorities for this trip changed. It was obvious that she was quite ill, and time needed to be allocated to assist her and minister to her. We were blessed to have enough time to visit 9 facilities, accommodating them with clothing, personal hygiene bags, toys, blankets, hats, scarves, shoes, medical supplies and much more. We arrived in snowy Dzerzhinsk and work was waiting for us. Thousands of pounds of aide that had been sent prior to our trip waited to be sorted for distribution. Ray, Lynn, and our new board member, Denis, were all there to assist with the sorting. The 2 weeks that followed we visited the facilities listed below, visiting well over 1000 children and many adults. We put clothing on children (when allowed), provided a hug or comfort when needed, visited with the older teens, and mentally challenged citizens. Many offered ‘needs’ lists for their continued needs, which is below if your heart feels the needs to assist in this ministry. Without your assistance we cannot possibly reach the thousands of people who need help, care and the message of Christ. We thank you in advance for your assistance. Dzerzhinsk Internat (110 orphans, 465 children): stockings, socks, hats, gloves, scarves (thank you Frieda H.), clothing, shampoo, toothpaste, personal care bags. Dzerzhinsk Orphanage (45 kids): clothing, socks, shampoo, toothpaste. Community Outreach in Dzerzhinsk: Over 200 lbs of clothing were provided for needy families via Yuri Y. Old Folks Home: Time did not permit us to visit this facility, but we left 3 large boxes (clothing, blankets, checkers/puzzles/cards, medicine) for later distribution. Thank you Ellen D. for the warm scarves and lap blankets. The Shelter: Time did not permit us to get to this facility, but 3 boxes of clothing, shoes, toys (thank you Raa Middle School), toothpaste and other items, were left for later distribution. Also, clothing soap, bar soap, shampoo and lotion were purchased and taken to the facility. “The Forgotten” – This facility provided a needs list, and several U.S. churches are working together on this list. Funds are needed for this desperately needy facility. Donetsk Home for the Elderly – 70 clients 70 – 95 yrs. of age: A new facility for us: Night gowns, men’s P.J.’s, slippers, socks, magnifying glasses, personal care bags, clothing, checkers, chess, walkers and toilet chairs Unfortunately due to running back and forth to Dzerzhinsk and Donetsk, and that Teresa got very ill on the trip, sadly we were unable to have lady’s Bible classes. The ladies understood, but it has always been a practice on each trip. His Kids, Too! is in the process of purchasing a kindergarten to renovate for a Christian Children’s Home, we need your help. Please contact us for a DVD on this project. Denis Lapin was added as a board member. Greeting cards are now on sale in the Gift Shop. All artwork by orphans. We continue to be amazed at the power of the living God we serve. He continually opens doors to opportunities of service, and you continue to provide the financial support for these programs. Some situations are more desperate than others, and we pray for discernment. We are sad to report that Christina passed away April 2, 2005. Services were held at the Polatarsky Church of Christ on April 4. We are so thankful for her Godly life, love, smiles, and hugs. She loved orphans, and shared that love with so many. We covet your prayers and appreciate your encouragement, and continued support. Teresa Fillmon Director/His Kids, Too! Our fall visit to Ukraine was exciting and very busy. We were pleased to have 2 additional sets of hands with us, as a couple accompanied me from Minnesota. Dave and Fami D. have plans to adopt a little girl from Russia, but had the desire to go and serve and orphans and widows prior to their adoption. Our trip would consist of visiting the facilities that His Kids, Too! already is servicing, accessing new needs, visiting new facilities that have requested assistance, meeting with board His Kids, Too! board members, visiting with church members, and teaching ladies Bible class when possible and meeting with 3 adopting families. All these goals were met (except we only met with 2 families as the other had already departed), and we were blessed to have enough clothing for 50 needy families in the community. We arrived in Dzerzhinsk and work was waiting for us. Thousands of pounds of aide that had been sent prior to our trip waited to be sorted for distribution. We were thrilled to have some church members available to assist us in this huge endeavor. Fami and Dave had brought supplies for personal care bags, and those were also assembled for distribution. The 2 weeks that followed we visited the facilities listed below, visiting well over 1000 children and hundreds of adults. We put clothing on children (when allowed), provided a hug or comfort when needed, visited with the older teens, and senior citizens. The Lord impressed upon us the great need for discernment and gentle care for all these in need. Many offered ‘needs’ lists for their continued needs, which is below if your heart feels the needs to assist in this ministry. Without your assistance we cannot possibly reach the thousands of people who need help, care and the message of Christ. We thank you in advance for your assistance. Donetsk Home for the Elderly: This was our first visit to this facility, and didn’t know what they needed. We have forwarded back some items, but will be shipping items for this facility. Your help is greatly needed for these deserving seniors! Donetsk Feeding Program: This program started with 50 people, 2 have died (from age), and 3 are involved with one on one Bible studies. We have had one baptism so far. The program has been expanded to 60. A huge thanks to Peter P. for his generous donation to this program! Refrigerator to a member of the Donetsk feeding program. Hospital visitation to another member. Dzerzhinsk Feeding Program: This program has been down scaled to 10 from its 25. More community outreach will begin in spring with the addition of 15 communities poor. Thank you to Peter P. for his support of this program. Completion of greeting card project – cards are now on sale in the Gift Shop. All artwork by orphans. We continue to be amazed at the power of the living God we serve. He continually opens doors to opportunities of service, and you continue to provide the financial support for these programs. Some situations are more desperate than others, and we pray for discernment. We covet your prayers and appreciate your encouragement, and continued support. On this visit to Ukraine, we were able to travel to 5 cities and provide aide to thousands of children. It was a joy to visit with friends, church members, orphans, directors, and many others. The entire Fillmon family traveled to Ukraine for 3 weeks. We arrived safely, and were off by train to Dzerzhinsk. This trip was a combination humanitarian and Bible camp, as 27+ Americans descended on Dzerzhinsk. The children eagerly awaited our arrival, and we came with joyful expectations ready to sow the seeds of Jesus. There is a detailed list of distribution at the end of this report. We encourage you to review our website, www.hiskidstoo.org to see the Summer Photo Gallery. The Bible Camp consisted or 2 camps, 1 at a local school, the other at the local Internat (Boarding School) for orphans. Eighty children were at each camp. Every child received a Russian Bible, and each day was filled with learning, singing, playing, and praying. The first 10 days of our trip we visited facilities and then we had the camp. Our shipment had arrived (see Photo Gallery) in Crimea, but had problems with customs, and the would not be released until Thursday into the camp. Teachers were busy trying to pull together craft supplies, and in the end it all worked out, but it was fairly frantic. The kids didn’t seem to notice, until the supplies did come and then they realized the difference. A major portion of your humanitarian aide was in the shipment, thus making the last days in Dzerzhinsk quite busy with distribution. In just 4 days we distributed over 1000 lbs. of aide. We were blessed to make an agreement with the director of the local Internat that educates 460 children, and is home to over 70 children, that she allow us to set up a ‘clothing closet’ in a room where we could bring children to fit them with clothing. We not only serve the orphans, but many of the very poor students. Additionally in Dzerzhinsk, His Kids, Too! serves a local orphanage (50 +/- children), Artum Orphan Hospital (25+/- children), and the local mental hospital (40 patients). Each of these facilities was visited and aide given. We are also serving 25 widows with monthly food bags, in addition to helping with the Donetsk feeding program (50 persons). The Norvgorosk Internat is home to 45 orphans. This very poor facility and we have built a good relationship with the new director. She welcomed us warmly, and appreciated the orphanage assistance. The children were still wearing clothing from our last visit, and we could see other items we had previously donated. Stewardship is very important, but also, remembering that kids are very ‘hard’ on toys, shoes, clothing, etc. We understand that most things will need replacing frequently. The Artemivsk Baby Home was a new facility in Spring for His Kids, Too! This facility is home to 120 children between the ages of 0 and 4 yrs. old. This visit brought us on the first day that the new director and new chief doctor were at the facility. Our friend Natasha was there, and was a great help with introductions. WE were able to see all the children, and talked about the aide that they need and the future assistance that we will provide. In Donetsk, we visited Teremok Orthopedic Hospital (60 +/-), the Aids facility (130 children), and Our Children Orphanage (150 +/-). Each facility we were greeted warmly, and everyone was pleased with their gifts. We have some specific needs for these facilities, which will be listed below. We also visited the City Baby Home, where we needed to drop off a gift, and provide fruit for 120 children. This trip took us to a new facility. Traveling 2 hours from our base in Dzerzhinsk, we went to the facility that Ukraine ‘houses’ their most disabled children and adults. We made 2 trips to this facility, where ‘the Forgotten’ live. These people live in deplorable conditions, and are warehoused until they die. We forewarn you, the photos in the photo gallery are difficult to look at, but depict the true images of this place. Their needs are listed below. Each night while in Dzerzhinsk ladies Bible classes were offered. Attendance was good for the classes, with an average of 20 ladies each evening. After a discussion with the ladies, it was decided that they wanted to study the Parables. Dzerzhinsk Internat: clothing, shoes, socks, personal care bags (soap, shampoo, conditioner, toothbrush and paste, combs, hair clips for the girls, nail files, pencils, pens, stickers, chap stick), sheets, towels, toys/games, and sport equipment, medicine. Needs: personal care bags, shoes, facility needs repairs ($400.00), 3x ointment, Band-Aids. Dzerzhinsk Orphanage: clothing, shoes, socks, toothbrushes and paste, large bottles of shampoo, soap, sheets, towels, toys/games, sport equipment, medicine. Artum Baby Hospital: Blankets, sheets, clothing, toys, busy boxes for cribs, medicine. Needs: clothe diapers (pins and rubber pants), ‘busy boxes’, and crib mobiles, diaper ointment. Needs: mattresses, sheets, pillow cases (they have, but need new ones), cost for all for 50 beds: $250.00. City Baby Home – Donetsk: 20 kilos of bananas, personal gifts for workers and a specific child. Needs: Funds for feminine hygiene products for 75 girls. Cost $160.00 per month. ‘Our Children’ Orphanage: clothing, blankets, socks, busy boxes, and toys, medicine, knitted hats, 20 kilos of bananas, plates and cups. We continue to serve these orphans with the juice and diaper program. Needs: Funds to continue existing programs ($200.00 monthly), 30 mattresses, sheets, and plastic lining for their new wing ($500.00); baby clothing, ‘busy boxes’ and mobiles for cribs. Needs: personal care bags, shoes, facility needs repairs ($500.00), clothing, new mattresses ($500.00). computer to process paperwork ($500.00), globes and wall maps. Mental Hospital: 40 sheets, socks, clothing for 40 patients, sleepwear for patients, underclothes. Widows – 25 local widows received their monthly food bags. His Kids, Too! has joined in the assistance of feeding 50 poor families in Donetsk. These combined efforts will cost $450.00 monthly to feed 75 people. Needs: Funds for the feeding program. The New Invalid Facility: 350+ children/adults: 4-28 yrs. of age. Clothing, personal care products, soap, socks, medicine, 500 bars of soap, laundry detergent, Pampers, underclothes, 300 cups, wheelchair, crutches, 9 buckets, 9 tea kettles, new Dr. coats, sport equipment, sheets, 4 Potty chairs (thank you Dr. Wharton! ), toys, busy boxes for cribs, and toothbrushes. Needs: for 300+ people/children: Funds to purchase mass medicines and syringes ($40.00 per box of 1000), 200 personal care bags for teen/adult residents, sheets ($400.00), towels ($250.00), blankets ($2000.00), laundry soap ($100.00), **cloth diapers** (plastic pants and pins – children lie in their waste), ‘Depends’, plastic sheeting ($100.00), 6 busy boxes, 10 baby walkers ($120.00 all). A cottage industry was established with many of the ladies in the church. Now available in the His Kids, Too! Gift Shop are children’s Ukrainian costumes, some with matching doll outfits. All proceeds will go to these ladies which will provide them with an income. This trip was a good one, but a difficult one. Our visit at the new facility was overwhelming. God gave us strength and vision to help these unfortunate, but precious souls. Teresa will return to Ukraine in October, and will visit each of these facilities again; over 500 lbs. of winter aide await distribution in Ukraine. More is on the way. We thank each of you who support this work through your prayers, encouragement, and financial giving. Every dollar can make a difference. Lives are changing. On this visit we were able to travel to 4 cities and provide aide to hundreds of children during my recent trip to Ukraine. It was a joy to visit with friends, church members, orphans, directors, and many others. Teresa Fillmon, Director of His Kids, Too! and 13 yr. old daughter Haley, traveled to Ukraine for 2 weeks in March. We arrived safely and met our almost 2000 lbs. of humanitarian aide, waiting in Dzerzhinsk for distribution. There is a detailed list of distribution at the end of this report. We encourage you to review our website, www.hiskidstoo.org to review the Spring Photo Gallery. Though much of the aide was sorted, we had the task of preparing each night for the next day’s deliveries. We were blessed to make an agreement with the director of the local Internot that educates 460 children, and is home to over 70 children, that she would accept the deliveries and store the aide until my visits. This was a big blessing, as the aide is presently sent to another location and then is trucked to the Internot for distribution, since this is one the largest facilities His Kids, Too! assists. We not only serve the orphans, but many of the very poor students. Additionally in Derzhinsk, His Kids, Too! serves a local orphanage (50 +/- children), Orphan Hospital (25+/- children), and the local mental hospital (40 patients). Each of these facilities was visited and given aide. We are also serving 25 widows with monthly food bags. The Norvgorosk Internot is home to 43 orphans. This very poor facility has changed directors since our last visit, and the new director welcomed out assistance, just as the previous one. The children were still wearing clothing from our last visit, and we could see other items we had previously donated. Stewardship is very important, but also, remembering that kids are very hard on toys, shoes, clothing, etc. We understand that most things will need replacing frequently. The Artemivsk Baby Home was a new facility for His Kids, Too! This facility is home to 120 children between the ages of 0 and 4 yrs. old. The director was delightful, and very open to receiving assistance, though this facility was one of the nicest I have seen in Ukraine. We will assess the needs and see what is truly needed. Special thanks to Ira who traveled with us to this facility and made all the introductions. In Donetsk, we visited Teremok Orthopedic Hospital (60 +/-), a new hospital facility, and Our Children Orphanage (150 +/-). Each facility we were greeted warmly, and everyone was pleased with their gifts. We have some specific needs for these facilities, which will be listed below. Each night while in Dzerzhinsk, ladies Bible classes were offered. Attendance was good for the classes, with an average of 20 ladies each evening. Topics that were studied ranged from: The Beatitudes, Christ as our Foundation, Romans 12, and Philippians 2. Artum Baby Hospital : Blankets, sheets, stockings, clothing, toys, busy boxes for cribs, medicine. Needs: cloth diapers (pins and rubber pants), ‘busy boxes’, crib mobiles, and baby clothing. Our Children Orphanage : clothing, blankets, cloth diapers (pins and pants), socks, busy boxes, and toys, medicine, knitted hats. We continue to serve these orphans with the juice and diaper program. Needs: Funds to continue existing programs ($200.00 monthly), 30 mattresses, sheets, and plastic lining for their new wing ($500.00); baby clothing, ‘busy boxes’ and mobiles for cribs. Norvgorosk Internot: clothing, socks, personal care bags, sheets, towels, toys/games, sport equipment, medicine Needs: shoes, facility needs repairs ($500.00), clothing, new mattresses ($500.00). computer to process paperwork ($500.00). Widows – 25 local widows received their monthly food bags. His Kids, Too! has joined in the assistance of feeding 50 poor families in Donetsk. These combined efforts will cost $450.00 monthly. Needs : Funds for the feeding program. It goes without saying that this work could not continue without your assistance. We thank each of you who support this work through your prayers, encouragement, and financial giving. Every dollar can make a difference. You are changing lives. To God be all the glory!